They were starting to yellow, so it was time to get them in the ground, but the weather has seesawed so much and the critters are so prolific that I wasn’t sure I wanted to. All that loving work only to watch my otherwise healthy pea plants either die of frost or get gobbled by the beasts. Tough. But they either needed to go into the ground (or a pot or SOMETHING bigger with more nutrient and root-growth possibilities than the little 72-cell flats). It was, simply, time, though when you’ve sprouted them, nurtured them and watched them grow into beautiful 10-inch possibilities, leaving them on their own in the garden at night is a bit like giving your kid the car keys for the first time. (It has to be done but oh my!). So, on a relatively calm, sorta sunny day, I planted them in two different spots in the vegetable garden. 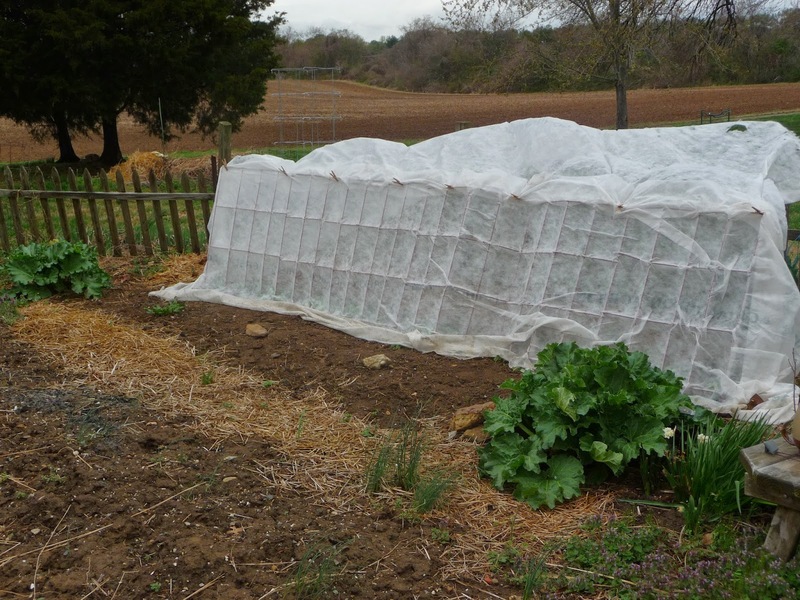 The snow peas went into in a bed that’s semi-protected by an outbuilding on the north side and I stuck a few Forellenschluss lettuces in just south of them to keep them company. Out of curiosity, and because I think they might be just past the tender, rabbit-tempting stage, I left them unprotected. 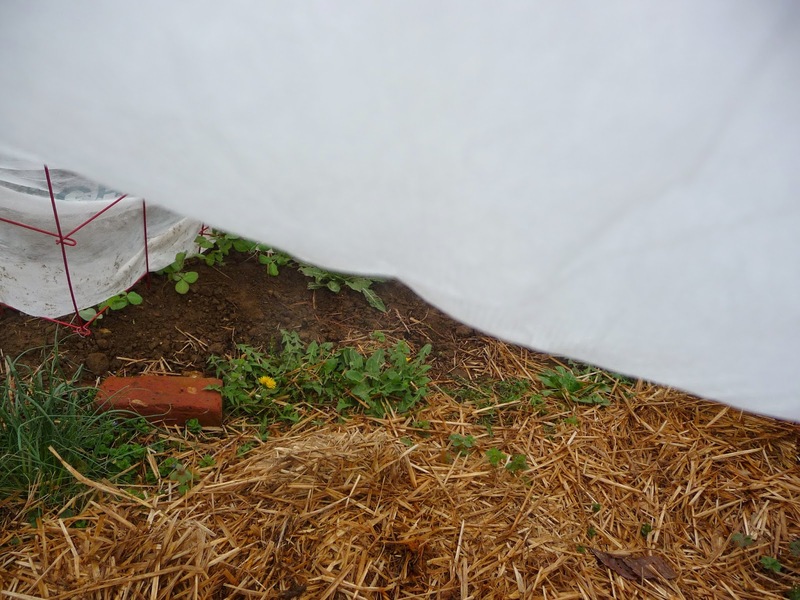 As I planted, I discovered that many of the peas had already started to send out climbing tendrils, and a few hugged each other like long-lost friends. Those I stuck in on either side of the fencing together so I wouldn’t have to unwind the tendrils, a tedious job at best. Plus separating those bonded plants just didn’t seem right. Now, a week later, and one night after a 26F night, so far, so good. The row cover has been an interesting experiment. The warm blustery wind from the SSW kept picking up the row cover from beneath its rocks so it’s spent days flapping like a tattered sail. 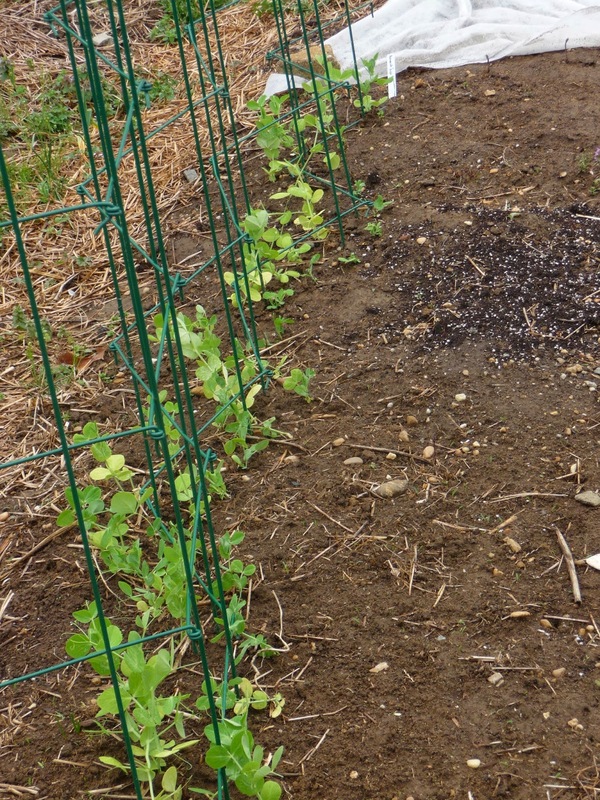 But, so far the peas are untouched, which may mean that even if it’s not covering the plants, it’s scaring the rabbits, which will do for now. Last night and tonight will be another test. Peas can go through a light frost; we had a light freeze last night here on the upper Easter Shore (the bird baths were all skimmed over). Tonight’s predicted to be more of the same. Now the wind is coming from the north, so I’ll go out later today and see if I can get the north side row cover stuff back under the rocks I use to hold it to the ground, (and take a reef in it to reduce the windage). Fingers crossed. Time and the weather this season will tell whether starting peas inside was a good idea – Anna suggested sprouting them in a plastic bag in the house (see comment on Seeding Peas Indoors for instructions) and then planting them out at the right time (a moving target this year). Even if it turns out to have not been worth the trouble of starting them, I’ve enjoyed it. That may be reason enough. p.s. 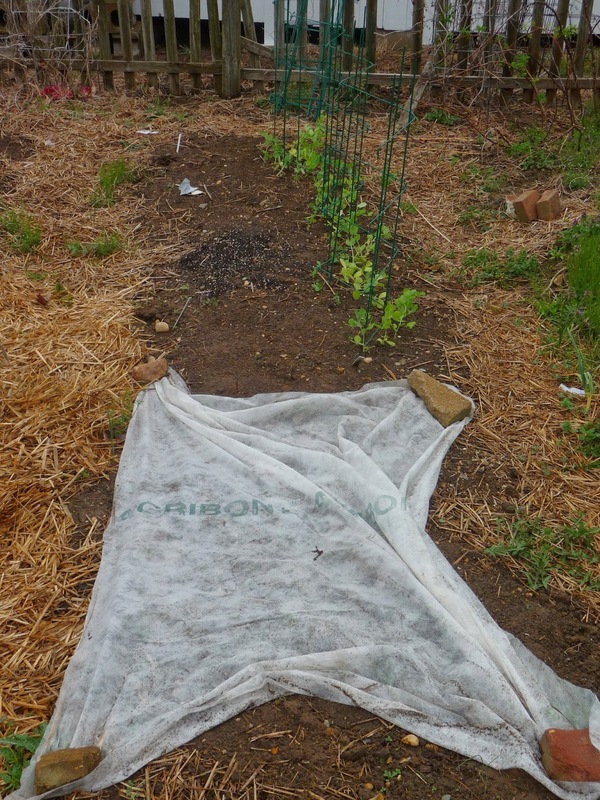 Thursday evening: The uncovered peas looked a little stressed, so I wrapped some row cover over them yesterday, and also reefed the tall sail down on the shell pea fencing so the whole kit and kaboodle doesn’t get taken down in the next big wind. So far so good. Only a few more nights of protection and we SHOULD be frost-free.